It doesn’t feel like a large city as I wander through the streets, the traffic is light and not congested, and the people are warm and friendly. It is normal when passing others to exchange a mutual greeting of “Buenos Dias ” and generally a smile, reminds more of a small village community. All the buildings in this area are very old, some are renovated, restored and freshly painted and others aren’t. I noticed when walking early in the mornings, when many homes and business open their doors and windows to welcome the early morning cooler temperature, even some of the unpainted ones open into lovely courtyards or homes with high ceilings and tiled stone floors. One of the first places I visited, after the Santiago Market area was Merida’s English Library, housed in a restored Colonial building and offering a good selection of fiction and non fiction books. 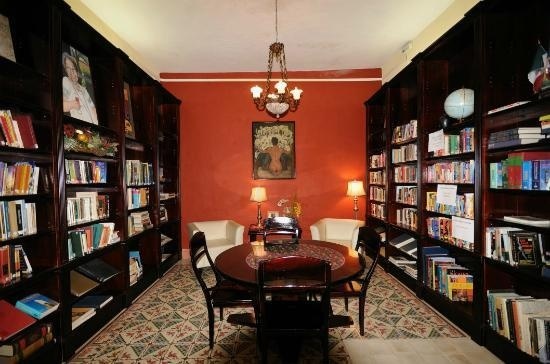 Also there is use of their reading room wherein there are many reference books of the Yucatan area as well as the Mayan civilization and culture (photo of reading room to the left), a nice cool place to do some research later. The Library also holds various events, one being a weekly evening event wherein Mexicans and native English speakers gather for an informal language exchange, there is no fee to attend. 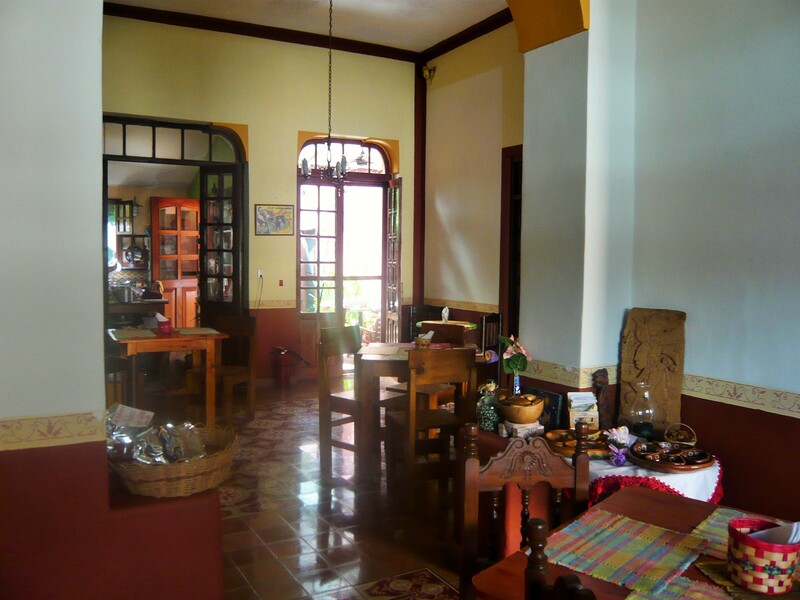 To become a member of the library it costs 300 pesos (less than $20 USD) for one year membership. I’ve been here nearly 2 weeks and haven’t eaten out since arriving, so today I decided to have breakfast at a nearby restaurant called “Maiz Canela y Cilantro” which is located on Calle 70 between Calle 55 and 55a. The restaurant serves both vegetarian as well as Mexican food. This charming place had a wonderful ambiance. 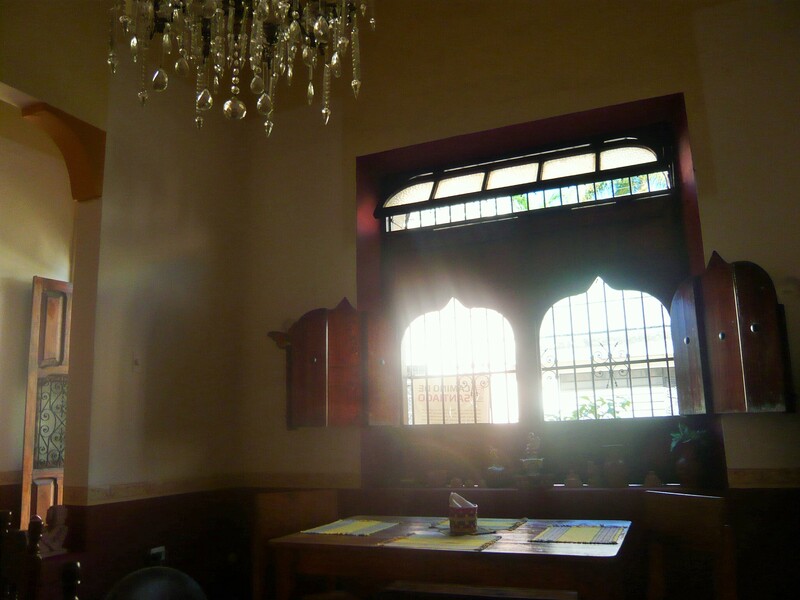 There was no A/C, however with the high ceilings, open windows and fans, it was cool and comfortable. I ordered coffee, bottled water and Pan Frances with honey and fresh fruit. I’ve never tried Pan Frances and found it something like French toast made with French bread. 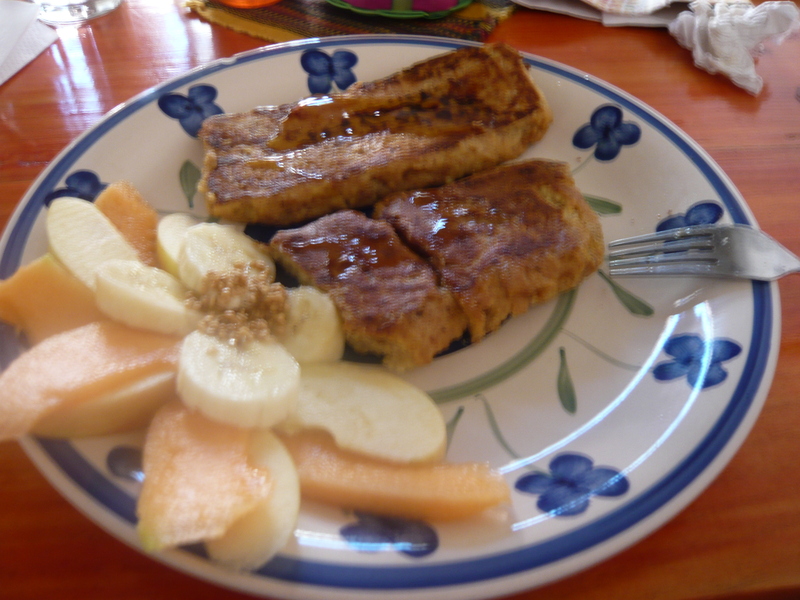 The coffee was excellent, strong and tasty, and the Pan Frances was also good and went well with honey and fruit. I ate everything as wasn’t hungry again until the evening. The service was excellent and the bill was 70 pesos (less than $4.50 USD) The exchange rate presently is $1 USD = 16.23 MX. 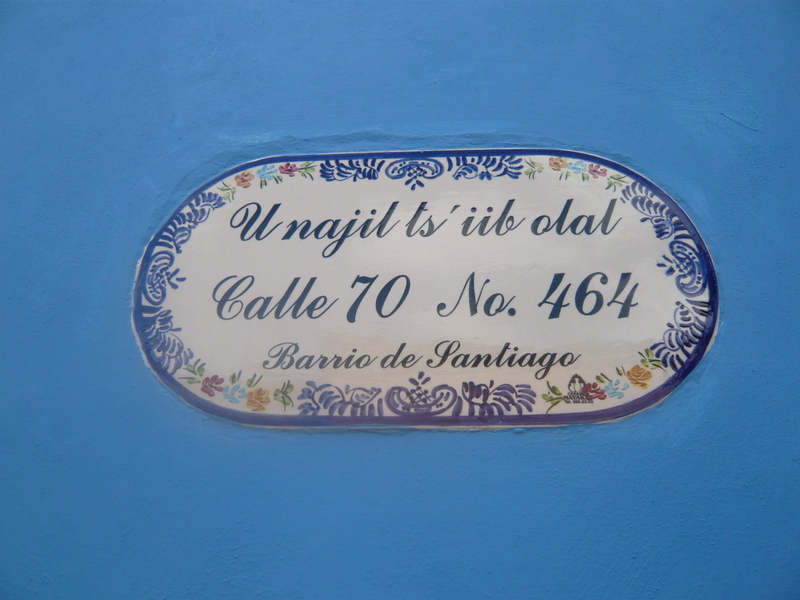 Upon leaving the restaurant I noticed a ceramic hand painted address plaque on the wall outside (see photo). I have seen these often during my walks on the walls outside many business and homes, all different, artistic and extremely attractive. I’m not sure what language is at the top of this plaque so I’m assuming Mayan. Close by to the library is where I take Spanish classes, I have a head full of Spanish vocabulary accumulated over the years, however I can’t seem to put it together apart from simple questions and answers. I found an excellent teacher named Anna who works at Spanish with Julissa where they use the Warren Hardy Spanish teaching method, this method is designed especially for adults, I really like this method as it doesn’t get bogged down in English grammatical terms. The rate is very reasonable about $6 per hour private classes. (I believe this is an off season rate).